An account administrator is the highest level of access anyone can have, having total control of all content, features and abilities. You can tell if you are an account administrator as you will have the company name, along with a monument icon beside it, in your black menu sidebar. You can see an example of the account &apos;monument&apos; icon here, where the name is &apos;Aframe TV&apos;. If your account has organisations enabled (we will cover that later), you may also see your account name again but with a different icon beside it, this one a building. Example below. 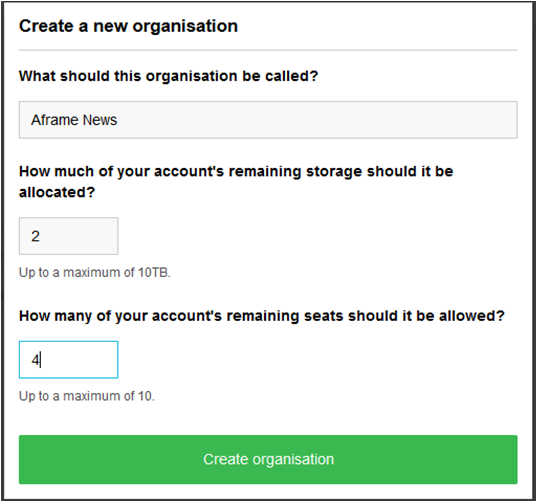 Organisations allow you to split your account storage and seat allowance between organisations which sit under the umbrella of your company account name. You will see the blue bar, highlighted on the image above, shows that you land on the Metrics section. The metrics menus give you a breakdown of various numbers across your account. Each of the headings across the top can be selected. They give you data relating to each of the sections, numbers from the last 12 months, week by week. You can also see the total number of users occupying the seats you have. Lets break down each section and take a look. Back to the top of your metrics and choosing the next section, seats. 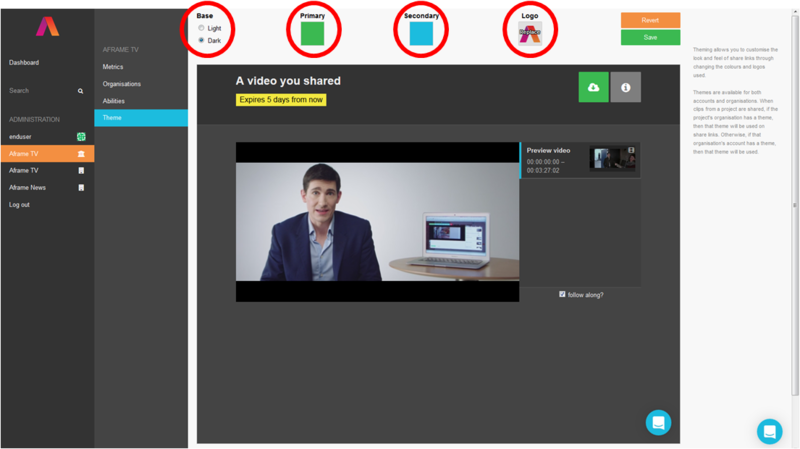 This will show all users, across all projects on your account. This page also allows you to remove a user from all projects, in one swoop, just select the red remove button to the right of their details (highlighted below). To find out more about seats, see this article. 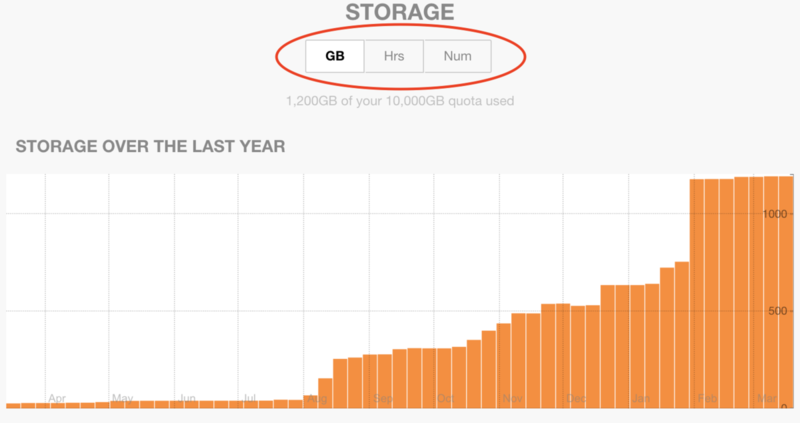 Selecting either upload or download from the top of your metrics screen will display uploads over the previous 12 months, with the options to switch between gigabytes, hours and number of files. Underneath the yearly graph, you have a break down of each project. 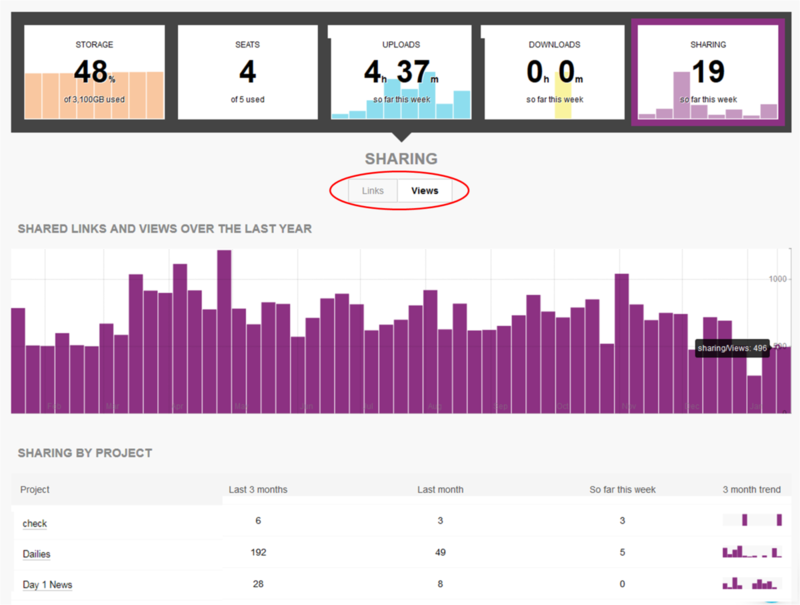 The sharing section presents metrics around the links that have been shared from your projects. You can see the previous 12 months totals, plus the break down below for each project. Notice that you can switch between number of &apos;Links&apos; and &apos;Views&apos;. This helps to see which projects are driving the most engagement. 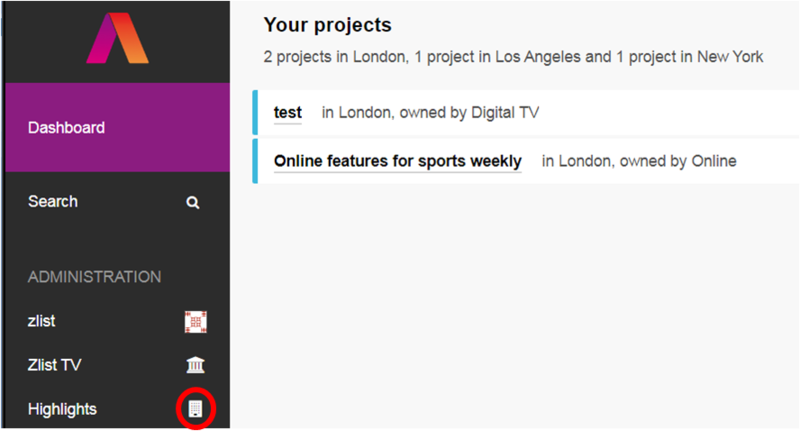 The next menu down on your account dashboard is &apos;Organisations&apos; (as shown below). If this has been enabled (speak to us if not), it allows you to split your account into separate organisations. An example that we will look at below, is that we currently have Aframe TV as the account but I would like to split my storage and seat allowance between different departments. This will give them their own allocation to manage and allows you to create an organisational administrator (if needed) for that organisation. This new admin can then create projects and manage everything for that organisation only. 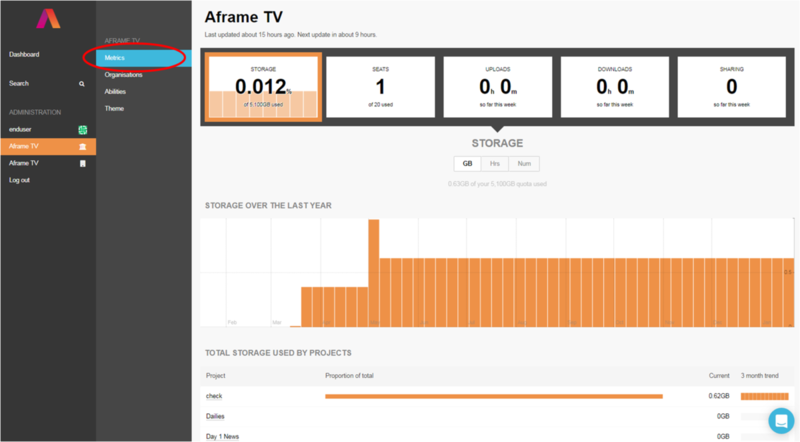 At Aframe TV we have a news, sports and archive departments. 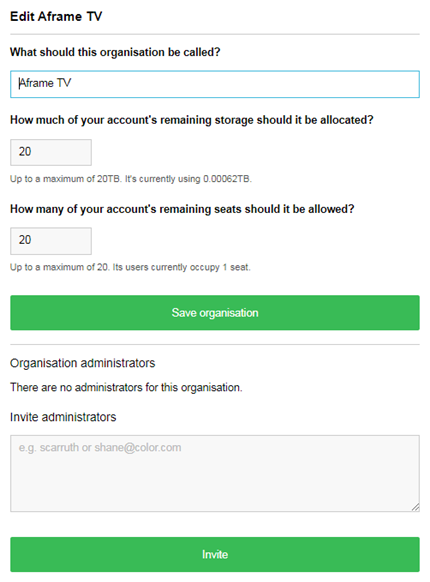 In this example we are going to split out Aframe TVs storage and seats, create an organisation and allocate some of both to the newly created organisation. The first thing you will notice is that all of your allowances are set against the main company (Aframe TV), so we need to remove some of that, to distribute elsewhere. 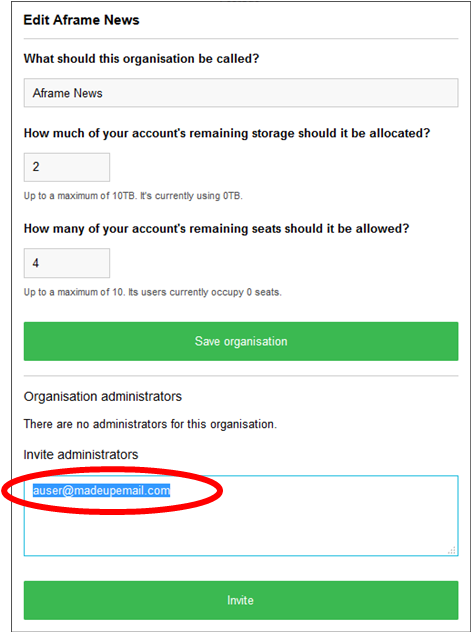 Enter the name, how much storage you want that organisation to have and how many seats. Selecting &apos;Create organisation&apos; will return you to your main menu. Here you will see that your new organisation is created centre of screen (Aframe News), along with its own organisation menu button to the left of screen. The next thing you may want to do is add an organisation administrator, this gives the user the ability to create projects for this organisation, along with setting abilities and a theme (both covered further down this article). ​Choose the edit button of people you want to be organisational administrators. Select &apos;Save organisation&apos; once you have added the email address. Any changes in here will be made for every user (including account admins) on every project. If abilities are disabled at an account level, then organisation admins will not be able to enable them for their individual organisations (as its been set at an account level). When an organisational administrator accesses their admin space, using the menu. If some features are disabled at account level, they will be greyed out for organisation abilities menus and cannot be changed. This works in the same way for an organisation. If an organisation admin disables an ability, any project in that organisation would not be able to use that feature. 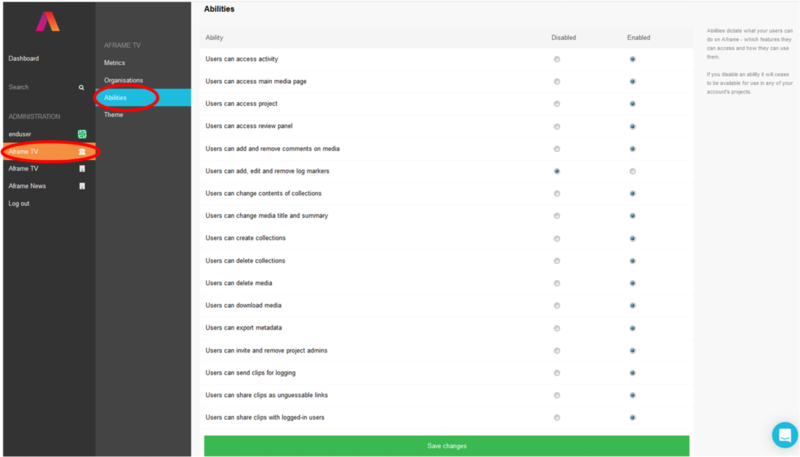 If abilities are enabled, then project admins can disable them at project level. 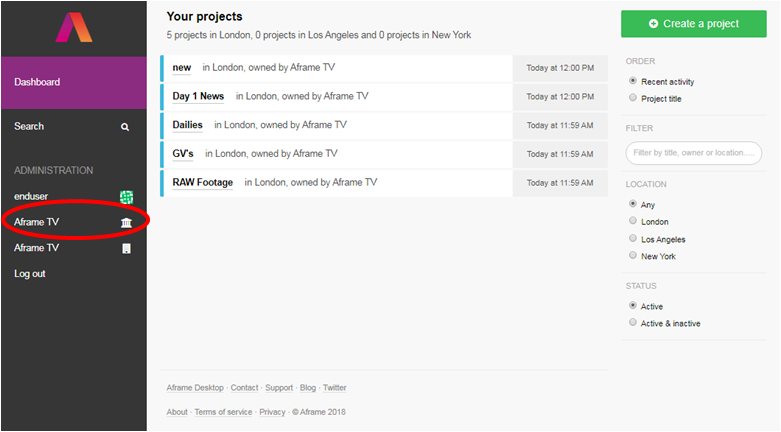 Project admins can find the abilities in the &apos;Settings&apos; menu, located on the black menu sidebar. The Theme menu gives you the ability to set a logo for your account, so that when share links or invites are sent they include the account logo and any themed colours set. Using the highlighted sections of the screen grab above, choose whether to have a dark or light background, then choose your button and highlighted sections colours. Select the Aframe logo to get the option to upload a company logo and then finally &apos;Save&apos;. You can always use the revert button to go back to Aframe defaults. When a theme is set at an account level, this theme (and logo if added) will be used for all organisations, unless they have their own set. To clarify, If an Organisations admin creates their own theme for that Org, it will be used (not the account set one). There is quite a bit of information here, so if you would rather we walked you through it, let us know!